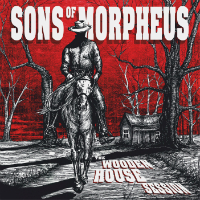 SONS OF MORPHEUS are a Psychedelic, Stoner Rock trio from Basel, Switzerland and “The Wooden House Session” is their third album so far; it was recorded at the same time as a split with German band SAMAVAYO. The band has a strong 70’s Psychedelic Rock influence, mainly from the works of JIMI HENDRIX EXPERIENCE and CREAM, mixed with classic Stoner and Desert Rock bands like KYUSS with a dash of Grunge, as well as influences that are more traditional of the Stoner and Sludge worlds like BLACK SABBATH. Things get started in a subtle way on “The Wooden House Session”, with instrumental “Doomed Cowboy”. The track is groovy, bass-and-guitar-led, with soft piano touches. It picks up the pace quite quickly and builds-up towards a chaotic SABBATH-like ending that transitions nicely into “Loner”. “Loner” moves on with another driving bassline and textured guitar work, building a great psychedelic atmosphere. The use of wah-wah on the bass gives it a peculiar sound and it has an extremely catchy chorus. A ZEPPELIN-esque coda brings the song to an end. Vocals by Manuel Bissing have an Alternative Rock delivery, somewhere between Kurt Cobain, Trent Reznor and Chris Cornell, albeit less dramatic in nature – and that’s a constant through most of the record. For a Stoner band, SONS OF MORPHEUS are quite song-based, avoiding unnecessary long jams like other bands tend to do. Only final track “Slave (Never Ending Version)” goes beyond the 5-minute mark, taking up a third of the album’s 34-minute duration. It truly fits as a closer, providing an outlet for lengthy guitar solos and a multi-section song structure with some tempo changes. Everything is still anchored with a bluesy riff and Bissing’s snarky vocals. This song truly puts the “stoner” in Stoner Rock with its lyrics about drug use and “no more pain” references. “Paranoid Reptiloid” has a bit of a meandering guitar jam in the middle with some noisy guitar work that evokes Neil Young guitar explorations; along with a heavy Desert Rock sound. Its lyrics are at the same time funny and thought-provoking, whether you take their meaning at face value (reptilians) or as a metaphor for human exploitation. The chorus feels almost NIRVANA-esque with its “they don’t care about us; we humans are nothing but a cheap resource. They force us, they exploit us.” “Nowhere to Go” comes next, following some soft acoustic guitar chords with real heaviness. The song builds its way to an intense outro, filled with distortion, manic drumming and pounding bass. “The Wooden House Session” is a strong album with memorable songs that feels truly enjoyable. The band manages to blend several influences in a coherent way, with lots of attitude. The raw sound production certainly fits the mood even if it means losing a bit of the clarity in the instruments at times. The drums in particular feel a bit muffled at several points, but it is never too distracting. On the other hand, the echoey effect on the vocals provides a surreal and ethereal atmosphere. A solid record that feels a tad too short. SONS OF MORPHEUS really leave the listener hungry for more this time around.